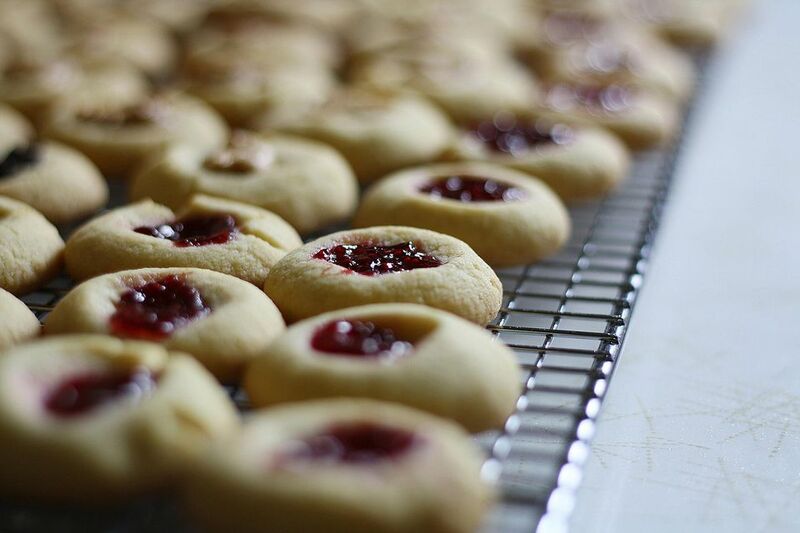 The name "thumbprint" is given to these cookies because you literally use your thumb to make a well in the dough. The small well is then filled with nuts, chocolate or in this case, homemade strawberry jam. The dough contains a cup of ground almonds which gives the cookies the lovely nutty taste. Almonds can be substituted with hazelnuts or even ground oatmeal. Using an electric mixer, cream together the butter and sugar until pale and fluffy -- for about 2 minutes. Add the egg and continue to mix until combined and smooth. In a large bowl, sift together the flour, baking powder, and salt. Add about 1/2 cup of flour mixture to the butter mixture, stirring continuously with a wooden spoon until smooth. Add the remaining flour mixture and stir until smooth. Add the ground almonds and vanilla essence and stir until combined. Roll small balls of dough and place them on the baking sheet about 1 inch (2.5cm) apart. Dip your thumb in some flour and then gently press down on the dough to make well in the middle of each cookie. Spoon a small amount of jam into each well. Bake the cookies for 10 minutes or until they are a light golden color. Remove from oven and cool on a wire rack. Serve.